In July 2007 a subject died while enrolled in an arthritis gene therapy trial. The study was placed on clinical hold while the circumstances surrounding this tragedy were investigated. Early in December 2007 the Food and Drug Administration removed the clinical hold, allowing the study to resume with minor changes to the protocol. In the present article we collate the information we were able to obtain about this clinical trial and discuss it in the wider context of arthritis gene therapy. On 24 July 2007 a 36-year-old woman with rheumatoid arthritis (RA) died, 22 days after receiving a second dose of an experimental, arthritis gene therapeutic . The Food and Drug Administration (FDA) placed the trial on hold while the circumstances of the participant's death were investigated; the National Institutes of Health Recombinant DNA Advisory Committee (RAC) launched a similar enquiry. At the beginning of December 2007 the FDA allowed the trial to proceed, suggesting that it did not attribute the subject's death to the gene treatment. A few days later, however, the RAC concluded that a possible role of the gene transfer in this clinical course cannot definitively be excluded due to the lack of data (RAC Minutes of Meeting, December 3–5, 2007). As the clinical trial restarts, we review the circumstances of this tragedy in the larger gene therapy context and consider the lessons to be learned. For much of its short history, gene therapy has suffered huge mood swings. Enthusiasm ran high after the first properly authorized gene transfer to a human in 1989 , but was stilled instantly by the 1999 death of Jesse Gelsinger in a gene therapy trial at the University of Pennsylvania . A more measured optimism returned when the first apparent gene cures of X-linked severe combined immunodeficiency were reported in the early 2000s , only to be dashed again by the occurrence of leukemia in several of these subjects . Similar technology has been applied successfully to treat X-linked chronic granulomatous disease , and the death of a subject in a Swiss–German trial in 2006 was attributed to the disease, not to the gene transfer . Matters have been improving since then, with apparent cures in several cases of X-linked severe combined immunodeficiency, adenosine deaminase severe combined immunodeficiency  and melanoma , and promising clinical responses reported for Parkinson's disease . Thirty-two phase III clinical trials are underway , and the first commercially available gene therapy – Gendicin, for tumors of the head and neck – has been launched in China . Just when circumstances were beginning to look promising again, another gene therapy death was reported  – this time involving gene therapy for arthritis (Table 1). Death related to gene therapy? 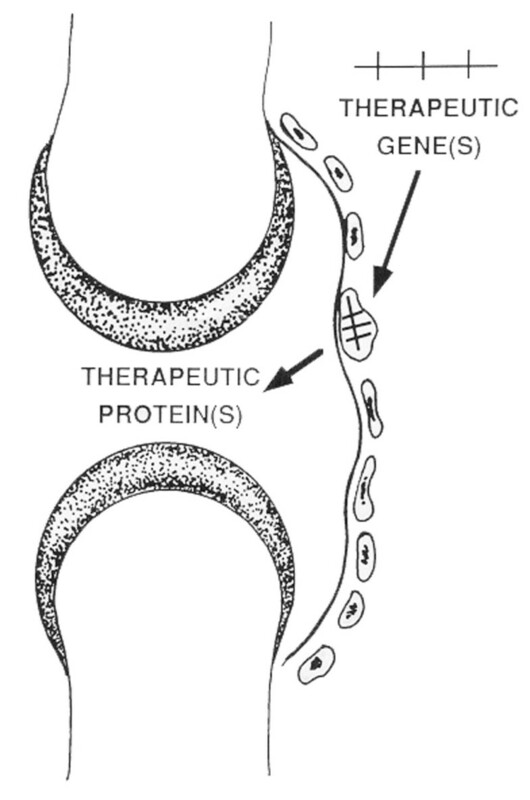 Although not an obvious target for gene therapy, arthritis has been on the agenda since the early 1990s when Bandara and colleagues suggested delivering genes locally to the synovial linings of diseased joints (Figure 1) . This strategy promises to provide therapies that are cheaper, safer, more effective and longer lasting than existing ones. The efficacy and safety of gene therapy approaches for treating arthritis have been demonstrated extensively in animal models of disease involving mice, rats, rabbits, dogs and horses . The basic concept – gene transfer to the synovium. Antiarthritic genes are delivered intraarticularly to the individual joint, where their expression leads to the accumulation of sustained, therapeutic levels of the gene product. Reproduced with permission from Bandara and colleagues . Most of the envisaged clinical applications for treating arthritis require sustained intraarticular transgene expression at fairly high levels. Nonviral gene transfer cannot fulfill these requirements  and, with one exception, has not been used in human clinical trials of arthritis (Table 2), despite its popularity for certain other applications (Table 3). Several recombinant, viral vectors have been used in human trials (Table 3) – of which adenovirus, herpes simplex virus, vaccinia and poxviruses give only transient transgene expression, so attention has focused on retroviruses and adeno-associated virus (AAV), which offer the prospect of long-term expression. All of these trials target rheumatoid arthritis except for the TissueGene and Kolon trials, which target osteoarthritis. The Targeted Genetics Corp. trial can also recruit subjects with psoriatic arthritis and ankylosing spondylitis. A phase I study injecting NF-κB decoy oligonucleotides is underway at the University of Osaka in Japan (principal investigator: Tomita). This study is not included because it is not strictly gene therapy. Also omitted for the same reason are two trials using TNF antisense RNA . aWhen expressed in conjunction with ganciclivir administration, herpes simplex virus thymidine kinase (HSV-tk) kills synovial cells and produces a synovectomy. AAV, adeno-associated virus; FDA, Food and Drug Administration; n, number of subjects in study; OBA, Office of Biotechnology Activities; TGFβ1, transforming growth factor beta 1; TNFR:Fc, tumor necrosis factor receptor:Fc domain of immunoglobulin fusion protein. Most retrovirus vectors are derived from the Moloney murine leukemia virus, and were the first to be developed for human use . The viruses integrate their genetic material into the chromosomal DNA of the cells they infect, thereby providing a basis for long-term expression of the transgene. Because cell division is required for successful transduction by Moloney-based vectors, they are usually used in an ex vivo fashion. This method was used for the first two arthritis gene transfer trials [17–19], in which IL-1 receptor antagonist cDNA was transferred to the metacarpophalangeal joints of subjects with RA (Table 2). Although both of these studies confirmed that genes could be successfully and safely transferred to human arthritic joints in this fashion, with evidence of a favorable clinical response [17–19], enthusiasm for the ex vivo, retrovirus-based approach has waned because of cost and safety. Protocols using retrovirus vectors are costly because of the need for two invasive patient procedures and for ex vivo cell culture; they raise safety concerns because of insertional mutagenesis . For nonlethal conditions such as arthritis, it is difficult to justify the continued use of retrovirus vectors unless certain additional safety procedures are used. In three of the four ex vivo protocols presented in Table 2, the retrovirally transduced cells are surgically removed after injection. Additionally, in the recent protocols for osteoarthritis (Table 2), the cells are irradiated prior to intraarticular injection to prevent them from dividing, under which conditions they cannot form tumors. These particular protocols also reduce the cost and complexity of ex vivo gene transfer by using a transduced, allogeneic cell line. Most interest, however, has shifted to AAV as a safe, injectable vector for the in vivo, local gene therapy of arthritis . AAV is a parvovirus with a 4.7 kb single-stranded DNA genome . The wild-type virus has only two genes, Rep and Cap, and cannot replicate without the presence of a helper virus. In nature the helper is often adenovirus, and AAV was first isolated in association with adenovirus, hence its name. There are multiple serotypes of AAV , but serotype 2 (AAV2) has been used in nearly all human trials, including the arthritis trial under discussion. Although the production of large amounts of recombinant AAV is difficult, recent improvements in technology have lowered this barrier, leading to its greater use . In the past, the single-stranded genome of AAV presented another limitation to its wider application. This limitation is that genes within single-stranded AAV genomes cannot be expressed unless the host cells successfully undertake second-strand synthesis. Depending on the cell type, this synthesis can be very inefficient. The recent development of self-complementing, double-stranded AAV genomes has eliminated this problem for those cDNAs that are small enough to fit within these now half-sized genomes . Transgene expression from self-complementing AAV is typically faster and far higher than expression from the equivalent single-stranded virus. Although up to 80% of human populations have circulating antibodies against AAV2 as a result of silent infections, titers of neutralizing antibodies are often low . Until recently, AAV was thought not to provoke cytotoxic T-lymphocyte immune reactions, a huge advantage for both safety and prolonged transgene expression. It was therefore a surprise when vigorous cytotoxic T-lymphocyte reactions were reported from a recent trial using AAV2 to deliver factor IX cDNA to the livers of subjects with hemophilia. This led to transient transaminitis and loss of factor IX expression . As a result of this observation and related findings, the immune response to AAV is undergoing a thorough reevaluation . Wild-type AAV causes no known disease, and recombinant AAV vectors have been used safely in gene therapy trials of a number of single gene disorders, as well as of Parkinson's disease, Alzheimer's disease and cancer. These trials have involved approximately 600 subjects in 47 human trials, 36 of them in the USA . In addition, two large phase III trials for prostate cancer using AAV are underway, and orphan drug status has been granted recently by the European Union for AAV-mediated gene therapy for familial lipoprotein lipase deficiency. The whole field of gene therapy was therefore shocked when a subject with RA died shortly after the injection of recombinant AAV into her right knee joint . The study in which the subject died is one of two clinical trials sponsored by Targeted Genetics Corp. (Seattle, WA, USA), a gene therapy company (Table 2). The Targeted Genetics vector, tgAAC94, is a single-stranded recombinant AAV2 virus containing the complete coding sequence of a fusion protein combining the extracellular domain of human tumor necrosis factor receptor type II and the Fc domain of IgG1 (TNFR:Fc). The gene product is identical to etanercept (Enbrel®; Amgen, Thousand Oaks, CA, USA), used to treat patients with RA. Expression is under the transcriptional control of a human cytomegalovirus immediate early promoter. The tgAAC94 vector is injected locally into symptomatic joints with the expectation that etanercept will be produced intraarticularly and will confer a local therapeutic effect (Figure 1). Before a human clinical gene therapy trial can proceed in the USA, it must be approved locally by the Institutional Review Board and Biohazard Safety Committee, at the federal level by the FDA and, if federally funded, by the RAC of the National Institutes of Health. Many privately funded protocols are also reviewed by the RAC. Unlike the FDA's deliberations, those of the RAC are in the public domain, and we have used this as the primary source of much of the information about the tgAAC94 protocols described in the present review, which is otherwise unavailable to other researchers. The phase I study was given public review by the RAC in September 2003. The protocol presented to the RAC was a randomized, double-blind, placebo-controlled, dose-escalation study allowing the recruitment of up to 32 subjects with RA, psoriatic arthritis or ankylosing spondylitis. The dose escalation provided 1010, 1011 and 1012 DNase-resistant particles (DRP) (equivalent to virus particles) per milliliter per joint, with the volume of injected tgAAC94 depending on the joint: knees, 5 ml; ankles, 2 ml; wrists, 1 ml; and metacarpophalangeal joints, 0.5 ml. The primary outcome endpoint was safety. Secondary endpoints included measures of efficacy, transgene expression, antibody responses to vector and evidence of vector spread to peripheral blood cells (Table 4). Significantly, subjects in the trial were not allowed concomitant anti-TNF therapy. RAC = Recombinant DNA Advisory Committee; TBD, to be determined – the highest safe dose, as determined from cohorts 1 to 3; TNFR:Fc = tumor necrosis factor receptor:Fc domain of immunoglobulin fusion protein. The study is now closed. It has not yet been published in the refereed literature but, according to data presented at the September 2007 meeting of the RAC, a total of 15 subjects were enrolled, 14 with RA and one with ankylosing spondylitis; 14 knee joints were treated, and one ankle joint. Four joints received placebo injections, five joints received 1010 DRP/ml and six joints received 1011 DRP/ml, but the highest proposed dose appears to have been omitted. No drug-related serious adverse events were noted. Unlike the phase I study, a subsequent phase I/II study was exempt from public RAC review but was described publicly at the September 2007 meeting of the RAC. Permission was given to recruit 120 subjects with a more ambitious dose escalation of 1011, 1012 and 1013 DRP/ml and in the same target joints with the addition of elbows, which received 1.5 ml vector. The endpoints of the phase I/II study were broadly similar to those of the phase I study, but included evaluation of additional potential outcome measures. The most important differences from the phase I study were the possibility to include patients who were already taking systemic TNF blockers and the administration of a second injection of tgAAC94 (Table 4). According to the protocol, 120 subjects in the phase I/II study are divided into six cohorts of 20 individuals. The first three cohorts receive 1011, 1012 or 1013 DRP tgAAC94/ml, and cohorts 4 to 6 constitute a phase II expansion to increase subject numbers. In each cohort of 20 subjects, 15 patients receive tgAAC94 at the appropriate dose and five patients receive placebo in a blinded fashion. In the subsequent, nonblinded part of the protocol, subjects receive tgAAC94 12 to 30 weeks after the first injection. When the trial was placed on clinical hold, 127 subjects had been entered into the study – spread almost equally between placebo and each of the three doses of tgAAC94. The majority had RA. Approximately 50% to 60% of the subjects were taking a TNF antagonist, most commonly etanercept, either alone or in combination with one or more disease-modifying antirheumatic drugs or prednisone; 52 subjects had received a second dose of tgAAC94. Prior to the subject's death there had been eight serious adverse events, of which only one (septic arthritis) was considered probably related to the protocol. Five subjects had notably elevated liver function tests, but these resolved either spontaneously or upon discontinuation of methotrexate or statin. A dose-dependent increase in neutralizing antibody to the AAV2 capsid was noted. Vector genomes were detected in the peripheral blood cells of certain subjects, especially at the highest dose, suggesting leakage of vector from the joint. It was not possible to measure accurately the level of etanercept expression in subjects on systemic TNF antagonists because of limitations in the assay method. No increase in circulating levels of total TNF binding activity was reported, however, in 16 subjects who were not taking systemic anti-TNF therapy. The first efficacy data were presented at the 2007 annual meeting of the American College of Rheumatology . A higher percentage of subjects who received tgAAC94 reported improvements in joint symptoms, function, and pain than those receiving placebo. The subject was a 36-year-old Caucasian woman with a 15-year history of RA. She had been treated with disease-modifying antirheumatic drugs since the early 1990s, and in 2002 enrolled in a clinical trial of etanercept. This was discontinued in 2004 because of a flare, and she was switched to the anti-TNF antibody, adalimumab (Humira®; Abbott, Abbott Park, IL, USA). The subject's right knee remained persistently swollen and tender, and received 10 intraarticular steroid injections between 2000 and 2006. Methotrexate had been administered from 1994 to 1999, discontinued due to anticipated pregnancy, and resumed in 2002. Prednisone had been administered since 1999. At the time of enrolling in the gene therapy study, the patient was taking adalimumab (40 mg subcutaneously every other week), methotrexate (20 mg subcutaneously once per week) and prednisone (2.5 mg once per day). The patient enrolled into the study on 12 February 2007 and was randomized to receive two injections of the highest dose of tgAAC94; namely, 1013 DRP/ml (that is, 5 × 1013 total DRP). The first dose was injected into her right knee on 26 February 2007. At the time of receiving the second injection on 2 July, the subject reported fatigue and a low-grade fever (99.6°F). The same evening she suffered nausea, vomiting, high fevers and chills, followed by diarrhea and abdominal pain. The symptoms persisted at fluctuating levels for several days, and on 12 July 2007 she was admitted to a local hospital with a temperature of 103°F and a blood pressure of 100/60 mmHg. Various antibiotics were administered, but by 17 July 2007 the patient's hemoglobin levels began to drop; coagulation and liver tests were abnormal, and there were episodes of hypotension and respiratory distress requiring intubation and inotropes. A blood transfusion was given and acute renal failure developed. On 18 July 2007 an ultrasound examination revealed an organizing hematoma or hemorrhage in the left retroperitoneal space. The patient also demonstrated worsening liver function, and her physicians were concerned she may need a liver transplant. The patient was subsequently transferred to the University of Chicago. The results of a liver biopsy taken at the University of Chicago were consistent with acute hepatitis without cirrhosis, so a transplant work-up was not initiated. She was empirically covered with multiple antibiotics, and antifungals were initiated. Renal replacement therapy was also initiated. Unfortunately, it proved impossible to stop the retroperitoneal bleed despite massive transfusion of blood products. It was not possible to identify the source of the bleeding, which eventually led to an enormous hematoma that compressed the abdominal organs and led to impaired kidney and lung function. This created abdominal compartment syndrome with subsequent worsening of the subject's hemodynamic status. Life support was withdrawn on 24 July 2007 and the patient died 20 minutes later. Autopsy confirmed the presence of a huge retroperitoneal hematoma weighing at least 3.5 kg. This caused focal infarction of the left kidney and pushed the diaphragm upwards, compressing the lungs. Blood cultures drawn on the day of the patient's death turned positive for Histoplasma capsulatum. Consistent with this, postmortem examination found Histoplasma in the liver, lungs, bone marrow, spleen, lymph nodes, thymus, kidney and brain. Granulomas, which are essential for effective host defense against intracellular pathogens, were not seen in spite of the abundant histoplasmosis. There was evidence of herpes simplex virus in certain tissues, but not adenovirus or cytomegalovirus. Oddly, the pathological examination found no evidence of active RA in either knee. Quantitative PCR identified trace amounts of vector genomes in the blood, spleen, liver and brain of the subject, larger amounts in the tonsils and high copy numbers in the right knee. The left knee, lymph nodes, heart, bladder, small bowel, trachea and adrenals were negative. Rep gene sequences that are absent from tgAAC94 and whose presence might indicate replication-competent AAV were detected in the heart, trachea and right knee, but not in the blood, spleen, liver, brain or tonsils. The most probable cause of death was disseminated histoplasmosis in conjunction with the retroperitoneal hematoma. Histoplasmosis is a recognized risk factor when taking TNF antagonists such as adalimumab and etanercept; moreover, the subject lived in an area where H. capsulatum is endemic. Histoplasmosis normally occurs 1 to 6 months after initiating anti-TNF therapy, however, and the subject had been on these drugs since 2002. Nevertheless, the most probable explanation is that the subject was already infected with the fungus when she received her second injection of tgAAC94, a conclusion that agrees with her slightly elevated temperature and fatigue. It is less easy to explain all aspects of the retroperitoneal bleed and this remains an enigma, although mycotic aneurysm is a leading but unproven hypothesis. Broadly speaking, serious adverse events could arise from either the AAV virions themselves or from the etanercept encoded by the transgene. As noted, twild-type AAV is not known to cause disease. Recombinant AAV does not integrate into the host genome, encodes no viral genes, is not highly inflammatory, and has been used safely in 47 previous human clinical gene therapy trials. Unlike previous trials using AAV, however, the virus was readministered. This readministration could have led to a severe immunologic reaction in the now sensitized patient, and indeed neutralizing antibodies to AAV2 were generated in response to administration of the tgAAC94 despite the immunosuppressive drugs she was taking. There is no information on the role of TNF in host defense to AAV. If immune complex formation led to pathology, we would have expected to see this most vigorously within the injected joint, producing a human version of antigen-induced arthritis. Ironically, of all the organs examined during the autopsy, the knees seemed one of the least affected by recent disease. None of the other organs examined showed signs of immune complex disease either, but interpretation is complicated by the immunosuppressive drugs being taken by the patient. It is difficult, however, to implicate a humoral immune reaction to the vector in the patient's death. Nevertheless, at its December 2007 meeting the RAC considered the possible involvement of cell-mediated immunity. Because the appropriate samples were not kept, it will not be possible to exclude this possibility. It is difficult to see how the production of large amounts of etanercept within the knee joint as a result of local gene transfer could be lethal, especially as it is well established from animal models that very little, if any, transgene product can be measured in the peripheral blood unless intraarticular transgene expression is extremely high [30, 31]. The spread and replication of tgAAC94, however, could lead to large amounts of etanercept being produced throughout the body, combining with adalimumab to elevate the total TNF-binding capacity to levels that permitted a confined, subclinical infection with Histoplasma to explode into a lethal, disseminated infection. Several lines of evidence argue against this possibility. It would have required the coinfection of a cell with tgAAC94, wild-type AAV and a helper virus. The most effective helper virus is adenovirus, and this was not detected in the patient. Herpes simplex virus was present, but provides much weaker help. Moreover, using sensitive PCR techniques, it was not possible to detect large numbers of AAV genomes throughout the body, although more than 3 weeks passed before this was analyzed. Because the subject died shortly after receiving a second injection of tgAAC94, scant attention has been paid to a possible role of the first injection delivered approximately 4 months earlier. The total TNF-binding capacity of the serum increased progressively from 5.4 mg/ml before the first injection of tgAAC94 to 8.6 mg/ml at the time of the second injection. The latter value is within the normal range for patients taking adalimumab, but is above the level present in the subject's serum before starting gene therapy. The steady rise in serum anti-TNF after the first injection is intriguing because transgene expression from single-stranded AAV vectors such as tgAAC94 is also progressive. Based upon her erythrocyte sedimentation rate and C-reactive protein levels, the subject had no evidence of systemic inflammation prior to the first injection, yet developed fluctuating but impressive increases in erythrocyte sedimentation rate over the subsequent several months. At the same time, there was no indication of increased RA activity. This raises the possibility that an infection, such as histoplasmosis, emerged shortly after the first administration of tgAAC94 (M. Crow, personal communication). Further consideration of this possibility begs the question of how an intraarticular injection of tgAAC94 could influence serum levels of anti-TNF given our earlier statement that gene products expressed intraarticularly do not escape from the joint. In response, we can point to studies (for example ) noting that even experienced orthopedic surgeons can miss the intraarticular space when attempting to inject knee joints. Although circumstantial evidence appears to link gene transfer to the subject's death, it remains difficult to identify a totally convincing, detailed scenario through which tgAAC94 could have been the critical factor in her demise. This seems to be the conclusion of the FDA, which has allowed the study to proceed. Although gene transfer may not have played a role in the death of this patient, the episode identifies certain issues with the design and execution of the clinical trial that are worth airing. The most controversial aspect of the study is the injection of etanercept cDNA into the joints of subjects who are already taking TNF antagonists. Such dosing is based on the notion that symptomatic joints in a patient who is otherwise responding to TNF antagonists will benefit from additional, locally produced etanercept. The assumption is that these joints, unlike the responsive joints, receive insufficient TNF antagonist from the circulation. This is an interesting and plausible hypothesis, but it is difficult to find supporting evidence in the refereed literature. The study in question could help provide such evidence, were there a validated outcome measure for assessing disease severity in individual rheumatoid joints. The commonly used American College of Rheumatology and Disease Activity Score systems are of little use here, however, because they measure global changes in large numbers of joints. Evaluating efficacy was further complicated by the lack of control over background drugs. Thus it would be impossible to know whether any changes in a joint were due to gene transfer or due to some other drug the individual was taking, especially in rheumatic diseases with their flares and remissions. The ability to recruit from three different diseases (RA, psoriatic arthritis, ankylosing spondylitis) and inject one of five different joints only complicates matters further. The subject had previously taken etanercept for 2 years and switched to adalimumab when symptoms flared. This raises the possibility that she was one of those patients who stop responding to etanercept, in which case administering etanercept cDNA might have been pointless. Some commentators have questioned further the clinical judgment of injecting the trial subject with vector when she was already ill. Indeed, the possibility that the symptoms affecting the right knee joint were not caused by RA but some other condition, such as secondary osteoarthritis, has also been suggested. Moreover, her transfer to a local hospital raises issues of the investigative environment. Assessing the possible benefit of the etanercept gene is further hindered by the study's inability to measure etanercept protein accurately in humans. One of the key scientific questions pertinent to any gene therapy protocol is the level and duration of transgene expression. To initiate a clinical trial without the tools to measure this is peculiar. According to Targeted Genetics' 2003 RAC submission, the company was developing an ELISA for this purpose. At the September 2007 RAC meeting, however, it became evident that a radio-immunoassay was being used, and this could not distinguish between etanercept and other TNF-binding agents. During the same RAC meeting it was stated that an etanercept-specific ELISA was being requested from Amgen (Thousand Oaks, CA, USA), but data from this source seem unavailable at present. Measuring the total TNF-binding activity of the serum tells us nothing about the key therapeutic question of how much etanercept was expressed in the joints. Expression levels may be modest because tgAAC94 is a single-stranded AAV vector. Moreover, when carrying a green fluorescent protein transgene instead of etanercept, the vector only transduced a few percent of human synovial fibroblasts in vitro, according to the 2003 RAC documents. Synovial fluids are presumably available from subjects who were not on anti-TNF to allow measurements to be made without interference. One such fluid from a subject who received 1012 DRP/ml has so far been analyzed, and the TNF-binding activity was below the level of detection. The phase I/II study was allowed to go ahead when less than one-half of the subjects from the phase I trial had been treated, when the high dose of vector had not been administered and when several secondary objectives had not been accomplished. The reasons for curtailing the phase I study while permitting the phase I/II study are not publicly known, but it raises issues of oversight and data reporting that may be worthy of further discussion in the appropriate forum. Now that the FDA has lifted the clinical hold on the trial, the study can proceed in a slightly modified fashion. Vector cannot be given to subjects with a temperature greater than 98.6°F, with localizing signs and symptoms, or with unexplained fatigue or malaise on the day of administration. Patients with a history of opportunistic infection are excluded and patients are required to have failed at least one disease-modifying antirheumatic drug. Subjects who will receive a second dose of tgAAC94 will first sign a revised informed consent. The FDA is also requiring additional monitoring, including blood draws at additional timepoints after administration of study agent for complete blood counts, serum chemistry, vector DNA, TNFR:Fc protein and potential T-cell responses to AAV2 capsid. In a recent review on arthritis gene therapy we argued for more clinical trials but cautioned that the 'acceptance of a gene therapy approach for nongenetic, nonlethal diseases such as arthritis is marginal ..., and a serious adverse event could destroy the entire enterprise' . The case currently under discussion has given the field a scare, but it seems that the authorities are not holding gene transfer responsible for the subject's tragic death. The logic behind a local, intra-articular gene therapy approach to treating arthritis remains as compelling as it did when first published over 15 years ago , and we continue to believe it will eventually form part of the clinical armamentarium . Examination of the clinical trial fatality has raised certain matters for further discussion, and collegial, dispassionate and reasoned consideration should help us all to develop the safe and informative clinical trials needed to move this area forward. = tumor necrosis factor receptor:Fc domain of immunoglobulin fusion protein. The authors are very grateful to the subject's husband for giving his permission for this article to be submitted. The authors thank Dr Bartlett, Dr Crow, Dr Federoff, Dr Friedmann, Dr Hogarth, Dr Katz and Dr Lipsky for critiquing earlier drafts of this paper. The authors' work in this area has been supported by National Institutes of Health grants DK 446640, AR 43623, AR47353-01, AR050249, AR048566 and AR051085. CHE and PDR are on the scientific advisory board of TissueGene Inc. (Rockville, MD, USA), for which they receive an honorarium but no stock. TissueGene Inc. is developing gene therapies for osteoarthritis. CHE and PDR are also on the scientific advisory board of Orthogen AG. Neither individual receives an honorarium, but CHE owns stock in the company. Orthogen is not developing gene therapies for arthritis. PDR and SCG are cofounders of Molecular Orthopaedics Inc. (Chapel Hill. NC, USA), which is developing gene therapies for osteoarthritis. The authors are developing a clinical protocol using AAV to treat osteoarthritis by gene therapy. CHE wrote the first draft of the manuscript, which underwent considerable revision and editing by SCG and PDR. All authors then collaborated to develop the final version.